I've always wondered about the English Common names of the two species from the genus Prioneris. 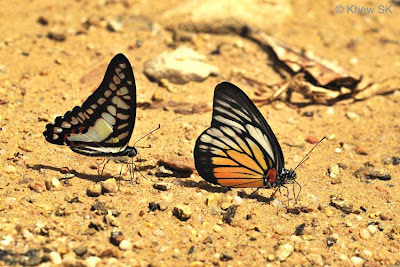 These large and robust butterflies found in Malaysia, belong to the family Pieridae. The two species, Prioneris philonome themana is known as the RedSpot Sawtooth whilst its close relative Prioneris thestylis malaccana is called the Spotted Sawtooth. 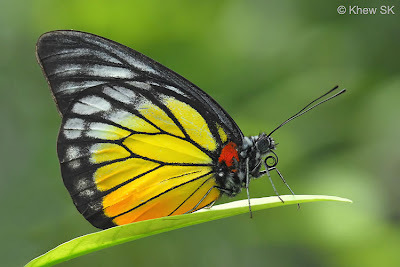 Both the species are large butterflies and resemble the Appias (Albatrosses) and the Delias (Jezebels), to which they are relatively related. However, the Sawtooths are powerful flyers and are fast on the wing. 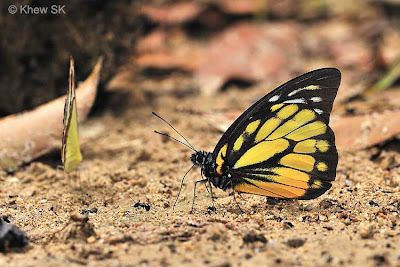 Both species are white above with the veins blackened in the outer margin areas The RedSpot Sawtooth has the hindwing basal two-thirds yellow, with a small red basal patch. The veins are prominently darkened. 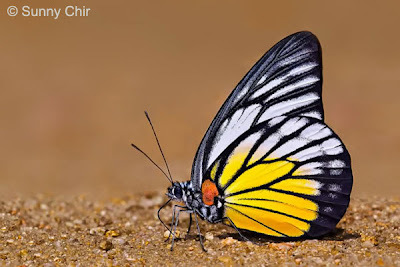 Its cousin, the Spotted Sawtooth is similar but has the entire hindwing yellow. 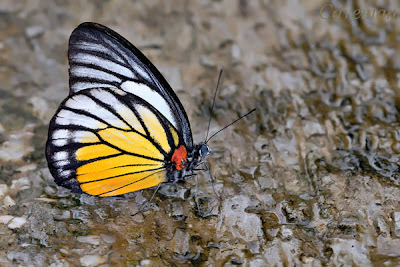 The RedSpot Sawtooth is the more common of the two species, and is found in the forested areas of Malaysia, often puddling with other Pierids and Papilionids. The Spotted Sawtooth prefers higher elevations but also has the same propensity for puddling at damp sandy stream banks tainted with animal urine and other decomposing organic matter. Coming back to the common name of "Sawtooth", it only dawned on me when I enlarged a shot that I took of the Spotted Sawtooth during post-processing, and I noticed the costa (or the leading edge) of the forewing. In the highly magnified view, one can observe that the wing edge is actually serrated with a series of sharp 'teeth' like the blade of a saw! 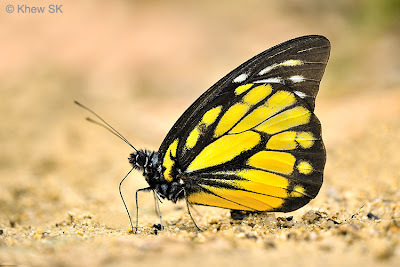 So now we may have stumbled upon one of the possible reasons behind why the early English collectors christened these two butterflies with the name of "Sawtooth". 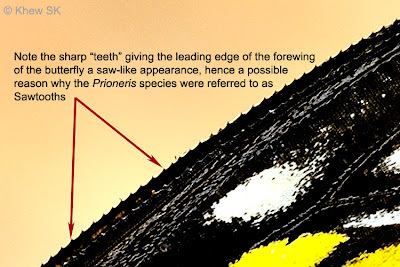 Click on the photo below to get a larger view of the serrated forewing of the butterfly's wing and you can see the details of the saw-like edge.